| Hosting |Software | Contacts | Map | | Humor You have a friend @Webby ! Check out these Resources and Essentials. We use them and can highly recommend them. Caution! Some of these programs are fairly large and may take some time to download! Online Converter :Convert files to different formats, for example PDF to DOC, different music formats, image formats, etc. Free. Music / Video Converter Video conversions made easy. A free Video Converter supporting all popular online videos. The VideoDownloadConverter™ toolbar is easy to use, simple & fast. Within a few seconds you can retrieve the converted audio or video file. Supported formats: MP3, MP4, M4A, M4V, FLV. The UnLocker Have you ever accidentally elbowed a new password into Windows and locked yourself out? Not yet? Or has a family member accidentally done that? Or the cat on her stroll over the keyboard? That can get extremely expensive, if you don't have the UnLocker. The Unlocker will get you back in there in 30 seconds. No fuss, no panic. Take the fear out of "Not Yet" with the UnLocker. Clickbook installs like a printer driver, and lets you print eBooks in pocket or purse size booklet format, all pages front and back lined up and collated perfectly. Just fold the stack and run staples through the fold. Getting 4 pages per sheet not only saves a lot of money, but makes reading in a car, bus, train or plane a lot easier, than using a stack of full size sheets. I have used ClickBook for about a dozen years, and I find it indispensible. Domain CrawlerCheck out who owns a certain domain? Where is it hosted, etc.? Eudora FAQs are now here. SmartFix The ONLY registry fixer, that I recommend! All In One PX Fixer has all the necessary tools included: Fix System Errors, Improve Startup, Clean Registry, Defrag Disk, Optimize System Settings, Back-Up, etc. Currently Smart OC Fixer is 50% off regular price! Mozy Remote back-up. 2 GB free, Unlimited space for $4.95 If your data is worth saving, save it far away from your computer with Mozy. FileZilla Full featured, rock solid, easy to use and free.Windows, Linux, and Mac. Forget the dozen other FTP programs, that I used to list here. Filezilla made them obsolete. MyMemorizer Free calendar program that sends you reminder emails for your appointments, birthdays, etc. For PDF readers scroll down a mile. OPEN Office Complete Office suite, similar to MS Office 2009. but ISO-standard Open Document Format (ODF), not limited to Microsoft's proprietary format. However, you CAN open and save documents, spreadsheets and presentations in Microsoft format. Totally free and quickly becoming the standard office suite in industry, commerce, military and governments. Roboform, still the best password manager. Clear Type Font tuner for XP (2.6 MB) Free. PhishPhinder Patch to make Outlook show underlying URLs, just like professional grade email programs do. Caution: A bug in McAfee marks this program as a phishing program, probably because of it's name or because it is better than McAfee in showing phishing programs. PC Formula clean up and tune-up e-book. Highly reommended! Screencast-O-Matic to record the action on your screen. No program download necessary, it's all done on the web. You just save what you produce, or send it to uTube. CanStockPhoto.com more than 1 million images available for a variety of graphics uses and more than 16,000 clip art images . License: $1 per image and up. ISO burner: Iso Recorder burn ISO disk images to CD and DVD (DVD with Vista only) Simple and free program. Save My Desktop! Saves your icon arrangement so that you can restore them to the way you had them before experimenting with monitor resolutions, or before accidentally deleting some. Launchy Launch programs with a few keystrokes. Really handy if you have too many icons or usually have them covered up with open programs. Command prompt Here Get an old fashioned command prompt option in the file Explorer. PUTTY Secure Shell Telnet. Free SSH program, much better than Telnet and perfectly safe. Remove NORTON This program allows you to completely and cleanly un-install Norton and make your computer work properly again. Belarc Advisor This program does a fast but thorough inventory of your computer and shows all installed hardware components like make and model of each drive, and of all software installed, and it's location in your computer. Not just essential for troubleshooting or for a pre-repair inventory, but also handy to file with your insurance. ADOBE Acrobat PDF Reader 35 MB, and the boot time pre-loader slows down the computer. Icon Hider from JC Matt. This program puts an icon into your task bar. One click of it hides the icons on your desktop. Next time you click that taskbar icon, all your desktop icons return in their old places. Anfy Java Applets Anfy Java applets and applet manager for easy configuration and customization of the applets. Also Flash applets. NOTEmaid Handy clean editor for anything from CGI to quick notes to HTML pages. Works in clean ASCII. Fonts FontPage lets you examine and compare all of the fonts on your system and beyond. You can view any typeface in bold, italic, underline and 3-D. You can also print out a specimen page for any font, or print a list of them. Webedit 3.11 Excellent HTML editor for advanced webmasters. Not free! EUDORA Excellent and easy, full featured e-mail program. When reliability and getting work done is a priority, Eudora is still the top choice. Pegasus Excellent, full featured, advanced e-mail program. Only 2MB ! DreamWeaver Site-List and settings back-up DreamWeaver is a great program, but periodically it trashes your site list. 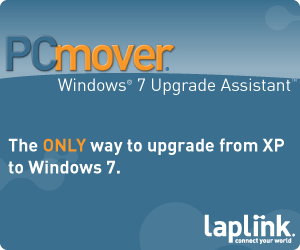 This program lets you back up your site list and configurations, and restore whenever needed. Magnifier A handy magnifier to use on pages with small print or small graphics. Qlock Set up tiny clocks for different towns and time zones. Real Time Automatically checks accurate real time sources and sets your computer clock. Winzip with info All instructions included. Software Post-it-Notes Programmable post-it-notes for the computer. You can set alarms for them to pop up before somebody's birthday or appointment. The PRO version works across a LAN. Stick a Post-it-note on somebody elses screen. Life saver for sending messages across the LAN when the Internet is down. 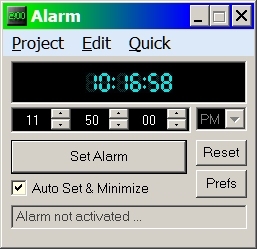 Alarm Program by David De Groot, Free! Simple to use, powerful and reliable. Use the built in Alarm sound or use your own music files. Click on the picture for no-fuss download. Colour This is the good old credit card sized color calc that lets you select a colour and paste the Hex number into an HTML file. Indispensable. PaintShopPro I have used this one for everything from web graphics to circuit diagrams. And still do. Good enough that I cheerfully sent in the voluntary registration money. (That's when it was still voluntary, for version 2. I have since then bought seven upgrades) Highly recommended! Fast Stone ResizerFree, fast, and versatile resizer. Ideal for making thumbnails. Yes, you CAN resize large JPG images to small GIF thumbnails, a folder at a time. Highly recommended by Dear Webby! Picture Resizer PIXresizer is a tool for quickly generating screen-friendly versions of your images with dramatically reduced file sizes. It is a photo resizing program that enables you to quickly resize one file or a selection of image files for use on the web and in e-mail. A great companion for webmasters and digital photographers. Resolve DNS of visitors, ideal for spot-checking or doing a whole week at a time. Runs on Win95. Just download your access log and run RESDNS32 on it. HTTP-ANALYZE for Windows Lets you run your stats yourself at whatever intervals you want. 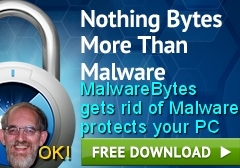 Protect up to 3 PCs with NEW Malwarebytes Anti-Malware Premium! This is the Mail Washer that I use and have used for over 10 years. I have tested many others, but Mail Washer is still The Best spam control. EffectivePapers - custom writing tool for all college and university students who need help from experts. This Undeleter will easily and securely recover deleted files from hard drives, flash drives, USB external drives, Zip drives, Firewire drives, digital camera cards, and more. This powerful recovery software can recover deleted files from most data loss scenarios. Is your data worth recovery? All In One PX Fixer has all the necessary tools included: Fix System Errors, Improve Startup, Clean Registry, Defrag Disk, Optimize System Settings, Back-Up, etc. Currently Smart PC Fixer is 50% off regular price! Ads in the very popular Dear Webby Humor letter are $50 per week for subscribers only. $100 per month for anybody else. That could be YOUR ad for $50 per week. Click a meal to a homeless vet! The number of mammograms donated thanks to clicks has dropped quite noticeably when these two ladies went away. So here they are back, working hard to get you to click. Donate by clicking on them! , Please Feed Dear Webby!